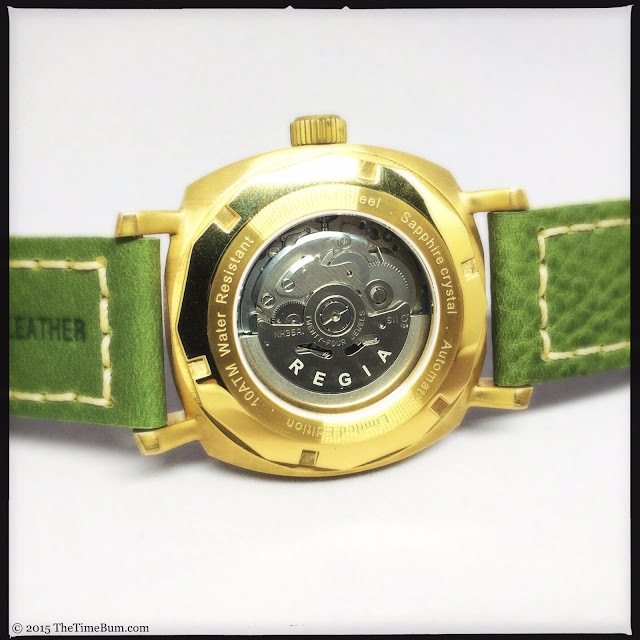 In early May, I introduced Time Bum readers to the Armare Regatta from Singaporean newcomer, Regia Watches. You may recall, I found the big brass diver to be an appealing take on the Panerai style, albeit with a quirk or two, most notably, the name engraved into the bezel, and its offbeat California dial. Still, there was something very cool about it. A few weeks later, when Regia notified me they were making a smooth bezel version I couldn't resist buying one. Before we get rolling, let me refresh your memory on the basics. 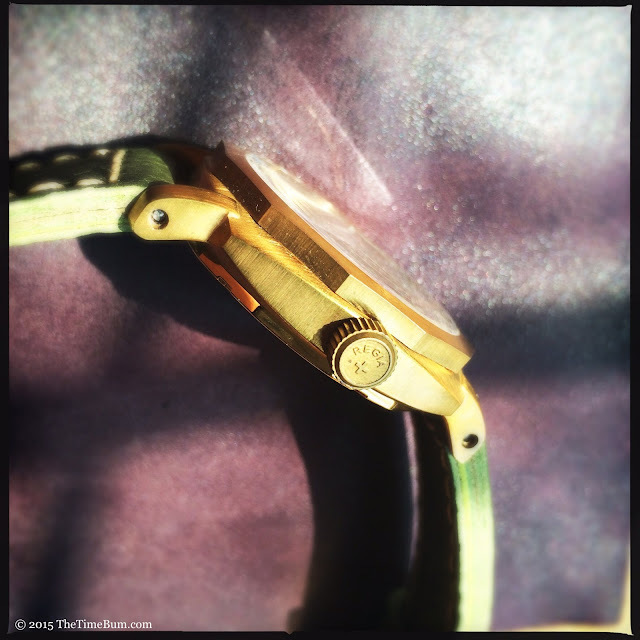 The Armare Regatta is a brass cushion case watch measuring 44mm wide, 54mm long, and 13mm thick. 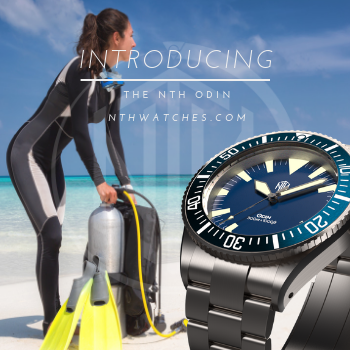 It has a screw down crown, sapphire crystal, a Seiko NH35 automatic under the display case back, and is rated for 100 meters water resistance. Buyers may choose between two sandwich dials: an Arabic 12/3/6/9 with a perforated index, or a California dial with Roman numerals on the left instead of their usual orientation in the top half. 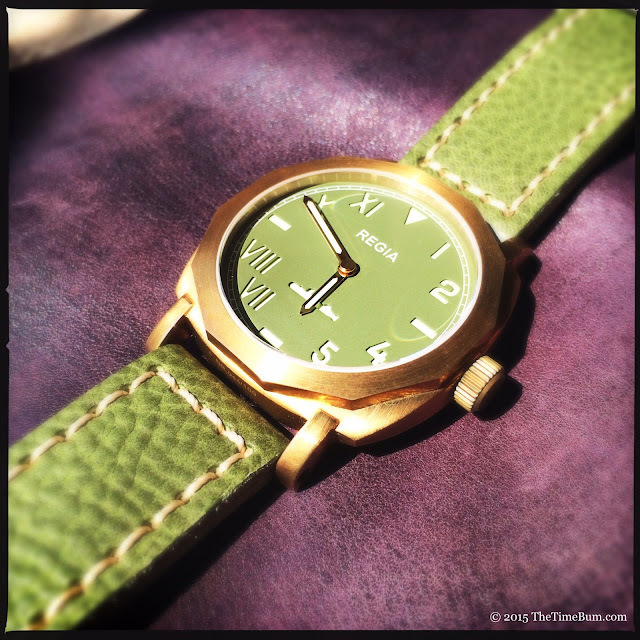 Dial color options are blue, black, and green, and come with both color coordinated and contrasting leather straps. As noted above, the bezel can be ordered smooth or engraved. All versions sell for $350. I am not a fan of the engraved bezel. It looks too much like a case back, so I ordered mine smooth. I picked green for the simple reason that I love the color but had nothing like it in my collection. 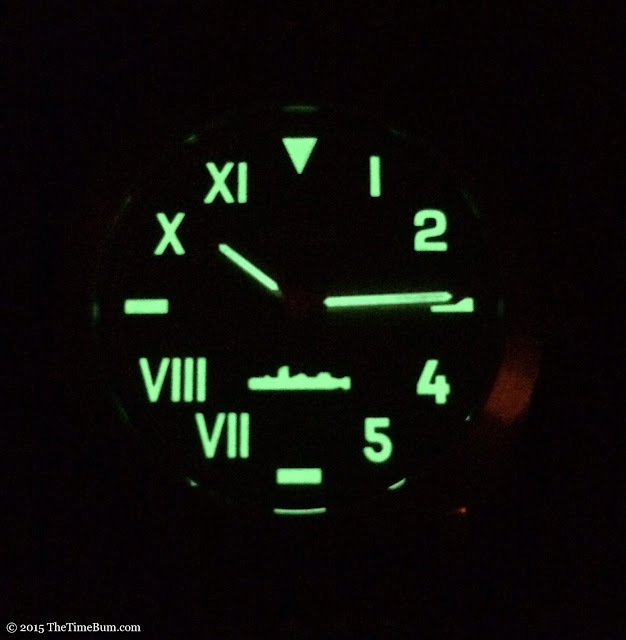 The sandwich dial plays to great effect on this watch as the numbers are a good size and the submarine detail is a nice touch. The gold hands are the proper length, the minute hand just stretching for the railroad index. All of it pops with the C3 SuperLuminova glow. It may surprise you to see that I chose the left-side Cali. Yes, I know in the preview I said the VII and VIII were too long and disrupted the dial's balance, but I had to give it a try. Face-to-face with the watch, I must confess that I like the layout. California dials are a bit peculiar to begin with so they lend themselves to playful experimentation. I still think those two numerals are too long, but I find them to be more idiosyncratic than irritating. It is something different, and in this case, different is good. When I read that the watch was inspired by the Panerai Radiomir 1940, I expected the case to be a straight homage. Instead, I was pleasantly surprised to find that Regia has taken its own approach. The overall shape is similar and like the 1940, the Armare Regatta has thick straight lugs, but where the Radiomir case is soft and smooth, the Regia is angular. The case sides are faceted and while the surfaces may bow, they meet with crisp edges and clean corners. Both the bezel and the display case back have twelve sides, which complements the case geometry. Like the case, the 3 o'clock crown is brass. It is coin edged and signed with the brand name and cross cast into its surface. 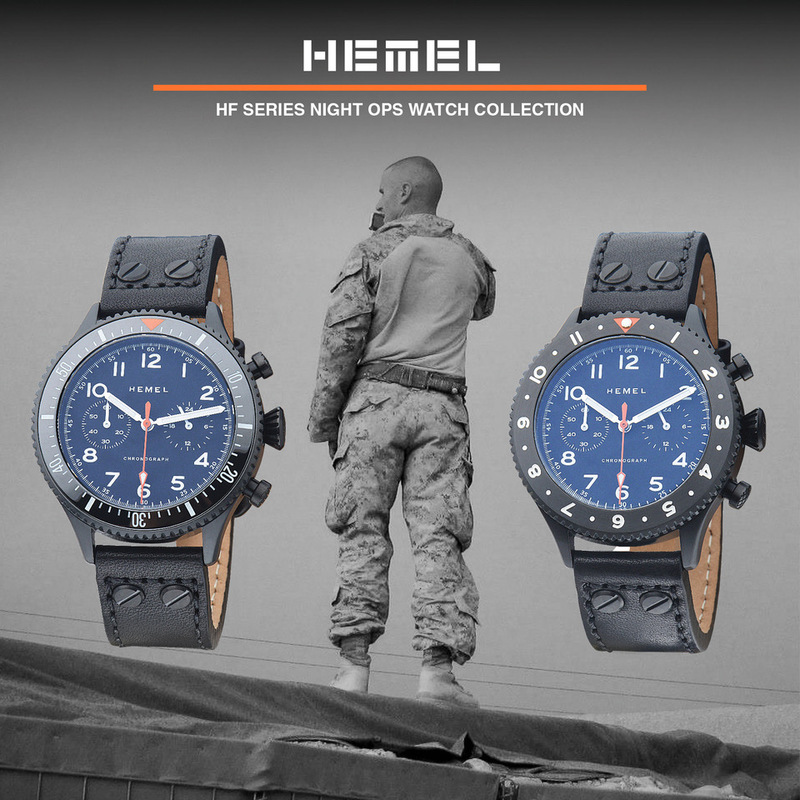 I love the look, although I wish they had chosen another symbol as the Swiss cross has no relevance on a watch from the other side of the world. I would have liked to have seen something to proudly represent its home country of Singapore. The crown screws down easily and is gasketed for 100 meters water resistance. 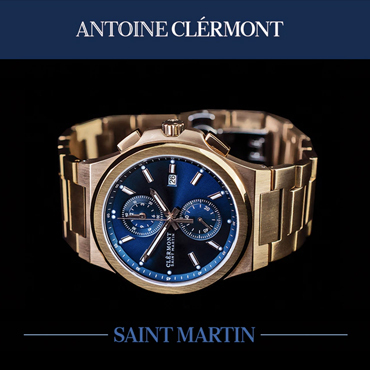 This is on par for watch in this style and likely more than sufficient for most owners (indeed, my old Magrette Regattare Bronze was only rated to 50m and it hasn't drowned yet) but it is on the low side in light of competitors like the 300 meter Maranez Layan. 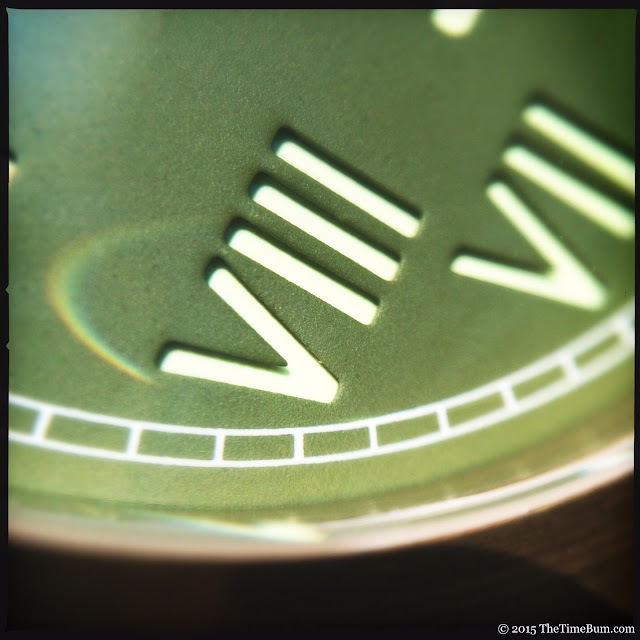 Part of the compromise in water resistance may come from the display case back. Some may question whether it is worthwhile to showcase the relatively prosaic Seiko NH35. This is a sturdy and reliable 24 jewel automatic, and although it is properly finished, it is not decorated except for the engraved rotor. 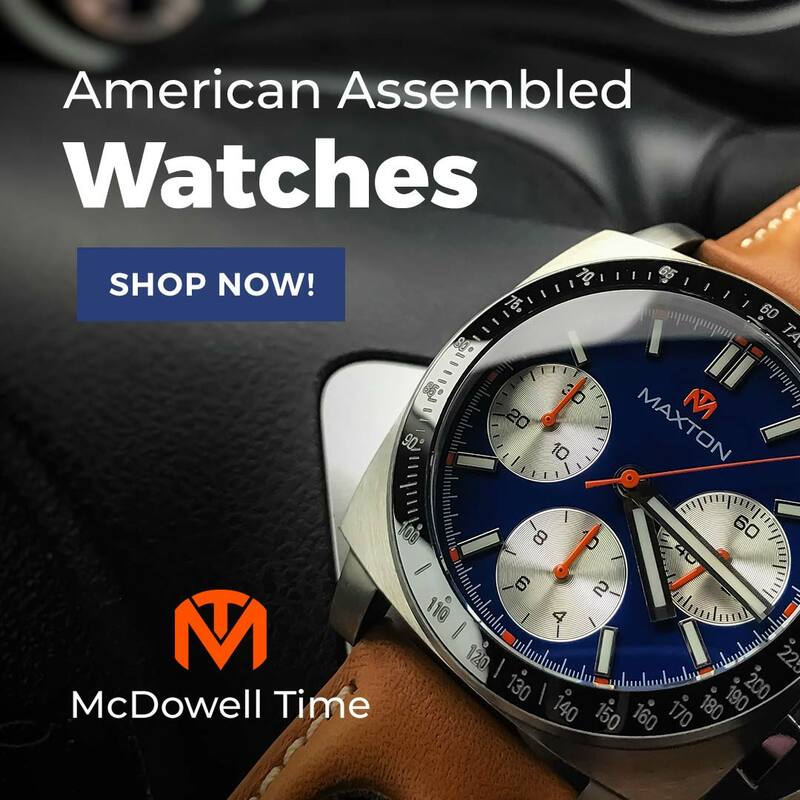 Personally, I like being able to see my automatic movements at work regardless of whether they are dressed up, but if I had been given the choice of a display back or higher water resistance, I'd certainly opt for the latter. 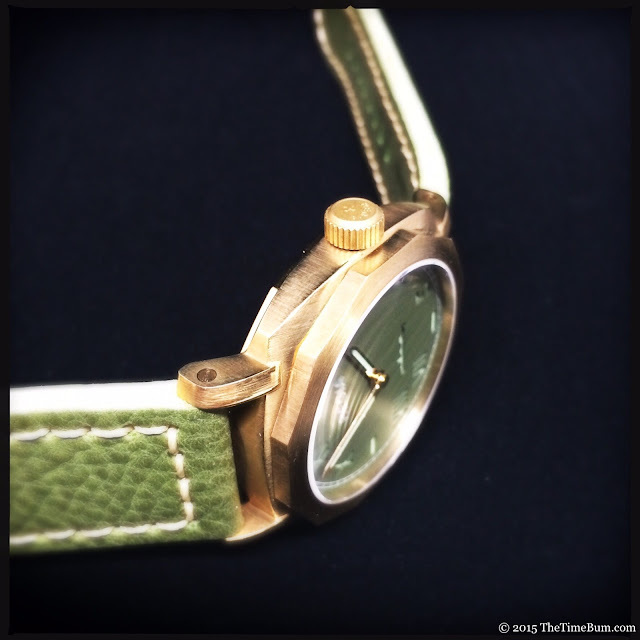 Two 24mm leather straps are provided, a lightly grained green and a tan Nubuck. They are 5mm thick and pliable right out of the box. The colors are lovely, but the unpainted sides show a sandwich of thin finished veneer over undyed filler. I know most stock straps share this construction, but I'd rather not see it. Raw cut sides only look good on quality leather. Anything less should really be finished or else it looks cheap. You have two options for strap attachment. 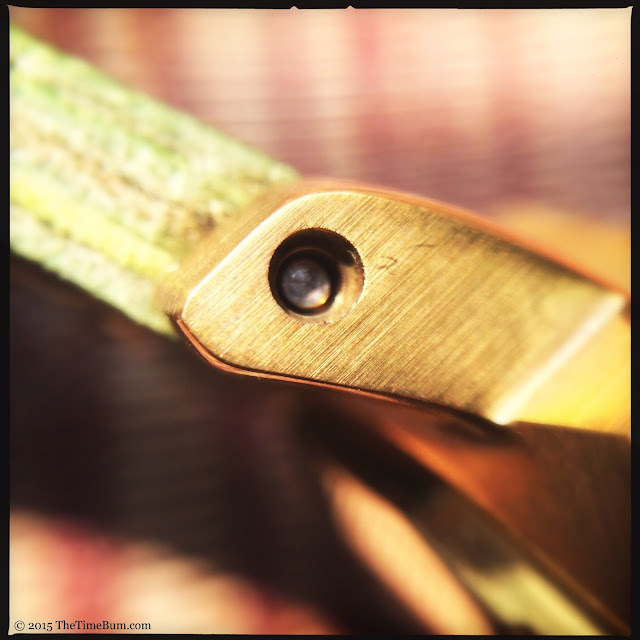 The watch arrives with a two-headed screw bar already fitted. If this is not your thing, you can remove the screws and use the supplied fat spring bars instead. can appreciate the screws as a design element, but I hate fiddling with them in practice, so I went right for the springs. With the screws removed, the outer holes are larger than you would normally find on drilled lugs, but they are not unattractive. 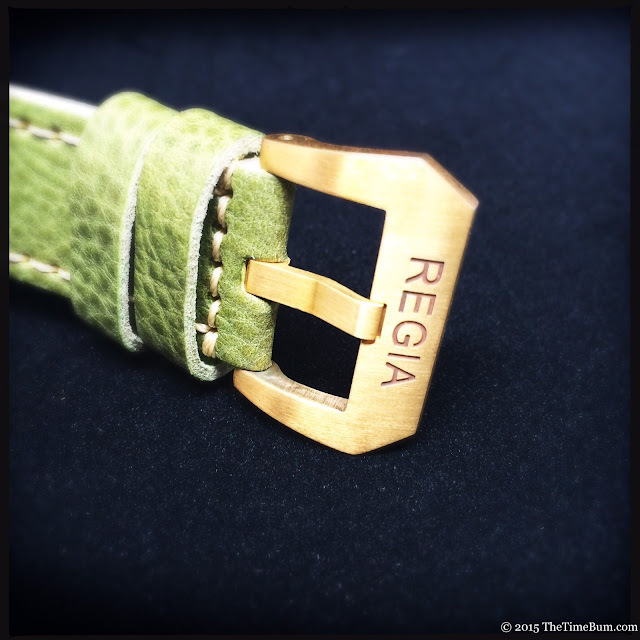 Regia supplies a 24mm brass buckle too. It is a beefy unit, a bit more angular than the typical Pre-V style and is signed with a nice deep engraving, not just the surface laser etching you find on most factory buckles. It too secures with a screw bar. A 1.6mm screwdriver is provided to handle all these fasteners, but in order to remove the straps, you will need two screwdrivers, not one, and 1.6mm is too wide to attack the buckle, so the whole project requires two tools in addition to the one supplied. This is hardly a deal breaker, but it highlights the problem I have with screw bars in general. 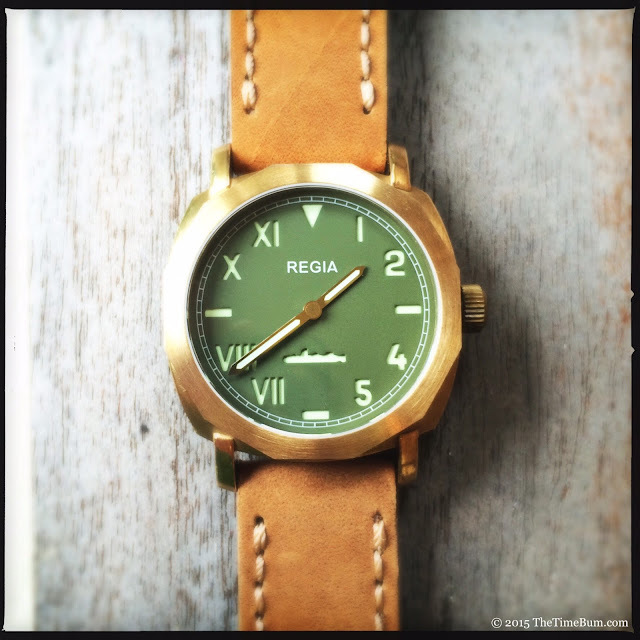 On the wrist, the Regia is every bit as commanding as you might imagine. The large case, broad dial, and big markers announce their presence and the Kermit the Frog color scheme doesn't hurt either. It is titled "Army Green" but it strikes me as closer to pea green than olive drab. 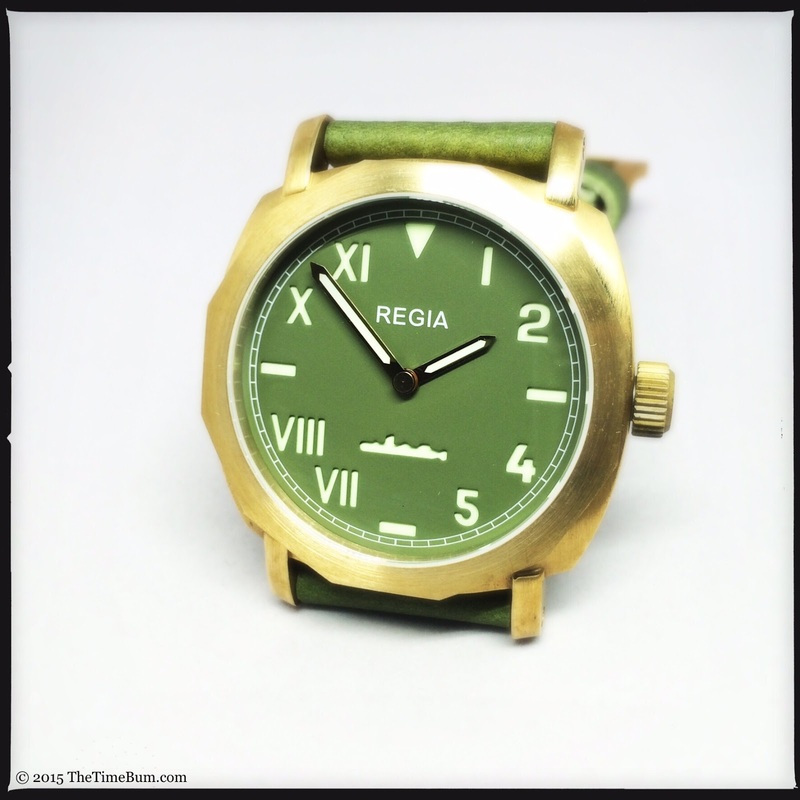 In black or blue with an Arabic dial, the watch might be more sober, but the Cali/green combo is just plain fun. It will be interesting to see how it looks as the brass ages. In fact, I might be tempted to whip a little Patina Science on this one and try to force some green oxidation with a vinegar fuming technique. Overall, I am quite pleased with my purchase. The watch has its quirks, but the case, color, and cutaway make it a winner in my book. It is a strong first model and a good value for the money at $350 USD. 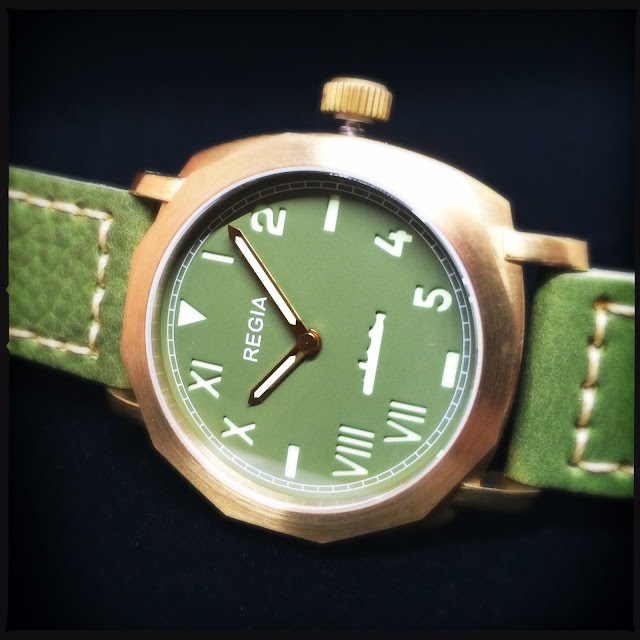 Better still, Regia will continue to expand their line. They just introduced a domed plexiglass crystal option, and they have other variants in the works. All in all, the Armare Regatta is a cool take on the bronzo theme. Pro: Sharp case, funky dial. Con: Fiddly strap attachment, cheap looking strap. Sum: Quirky and cool. The Time Bum approves.